This post comes again from running in NYC’s Central Park. If you are one of the thousands of runners who frequent the park, you already know of street artist De La Vega’s recent increased running path messages. If you are not in NYC, here’s an intro and here’s an article about the one-part controversial/one-part mainstream artist. De La Vega pushes the envelope of art and the idea of artists’ statements. 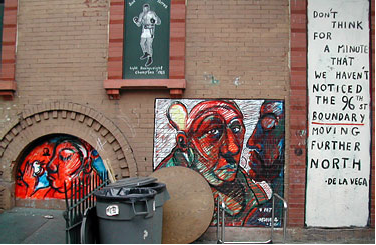 Sometimes his pieces are just quotes–often they’re social commentary, statements of witness to the social milieu of historically underserved parts of NYC, such as Spanish Harlem and the Bronx. Most often, the De La Vega pieces I see are sidewalk messages. And most often these messages involve fish, a fishbowl and the message: “Become Your Dream.” The sidewalk pieces in Central Park are unfailingly similar to his Spanish Harlem and the Bronx sidewalk chalk messages of hope and encouragement, De La Vega’s work is recognizable without a signature–just as a Monet or a Miro is unmistakably their own. 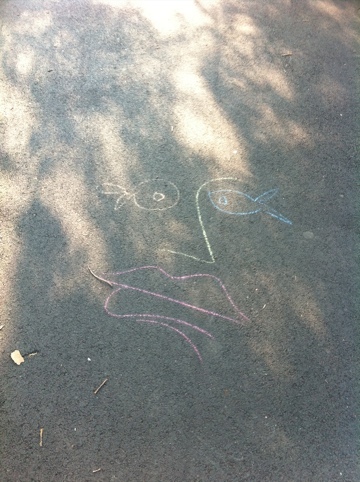 The sidewalk sketches then morphed and the fish were then engaging with each other in ways I haven’t seen De La Vega do. The lines of the art then also shifted–more angular and graphically pronounced. I imagine this is the “imposter’s” aesthetic when he or she is not playing this game of artistic identity. It’s even possible that this all was De La Vega, himself, at play with style. How do we understand what “Doppelganger De La Vega” was doing? Is it plagiarism of form and style? This month’s English Journal theme is all about ethics in the English classroom. Obviously there were multiple articles about plagiarism in the digital age. The articles hinted at the ways that plagiarism is “easier” now that we have the Internet–and not just with words, but with multiple modes. However, in the end, most of the articles concluded that we need is to have better conversations with students about how plagiarism is wrong. But is it? Is it in all it’s forms? One of the Imposter’s quotes read something like: “Stealing can sometimes be good–when it’s a De La Vega.” The artist was cognizant of the act–even intentional. Is that the difference between “stealing” and “tribute”? 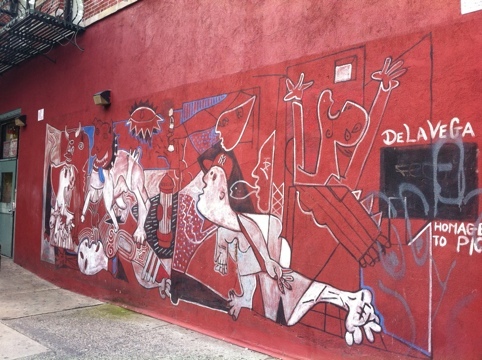 Down the street and around the corner is a piece by De La Vega himself, which is obviously a “copy” of Picasso’s Guernica. It is signed “De La Vega Homage to Picasso.” What makes this a not a “copy” of another artists’ work? The last five photos in this blog post were taken by me on my phone. What part of that is “copying” these artist’s pieces? Is just transferring media enough to ethically appropriate an image as mine? What about those shirts and magnets and key chains with images stretched across? What about transducing to another mode? Can I set De La Vega’s quotes to music and call them my own? Can I interpret them into image–and then is this finally not “stealing”? It would be silly to pretend that now that we are in “the digital age” we are suddenly new to repurposing, remixing and regurgitating others’ works. 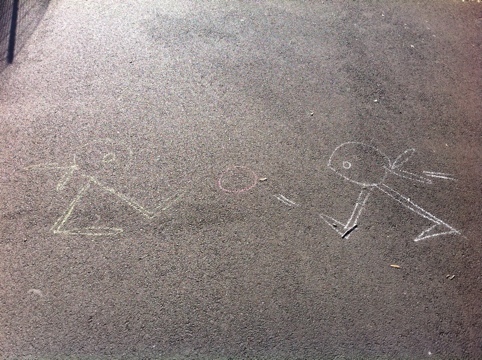 This practice is not new–and it may not even necessarily be “easier.” These artists did it with chalk and sidewalk. The bigger question is: How else do we make new ideas, if we don’t have another’s ideas to start from? The discussion of “plagiarism” must move past “it’s wrong” and how to make it “right” by incorporating references, understanding digital licensing, and copyright checks. Further still, perhaps we need to fundamentally reconsider what we imagine an individual does when he or she creates. I think it is telling that the word plagiarism originally meant ‘slave trader’. So lawyers branded copying as slaving almost from the beginning. That is an interesting bridge too far. “The first thing we do,” said the character in Shakespeare’s Henry VI, is “kill all the lawyers.” Metaphorically, of course. And the consequence devoutly to be wished?